The 70% rule in real estate is a guideline by which to quickly gauge what an investor should offer on a potential property, packaged in a compact simple formula. It is useful both to experienced investors looking for a back-of-napkin estimate of profitability in the field, as well as helpful guidance for beginning house flippers who are not sure how to formulate their offers. What is the 70 percent rule in real estate? The 70 percent rule states that you should not pay for an investment property any more than 70% of the After Repair Value (ARV), minus the cost of repairs. What are the pros and cons of the 70% rule when flipping a house? The benefits of the 70% rule and its formula are that you can calculate your offer on a fix and flip quickly, because the 70% rule equation has a margin for profit and costs already “baked in” so to speak. If you are able to calculate the ARV and the repair costs with accuracy, it’s likely that your end result will also be accurate as well. Along those lines, the weakness of the rule is that beginning investors may not know how to estimate rehab costs or the After Repair Value, and as a result the calculated margins may be wildly inaccurate. What is the formula for the 70% rule in real estate investing? where ARV is the After Repair Value of the property, and Repairs are your estimated construction costs to rehab the flip. The 70 percent rule equation, while fairly simple, can still be somewhat confusing as to what all the numbers mean, so let’s break the formula down even further. As you see, the formula contains the percentage value to multiply against the ARV, which assumes 30% left over. What is the “70” part of the 70% rule? The “70” part of the 70 percent rule refers to the discount that an investor must purchase the property at, before repairs, in order to have an adequate margin of 30% that covers the transfer and holding costs, as well as any profit. The lower the percentage, the higher the discount an investor is buying at; for example, at 60%, the investor’s margin would be 40% and the higher the potential for profit. What is the leftover “30” part of the 70% rule? Investors just starting out may calculate this simple 70 percent rule formula for a house flip and assume (incorrectly) that the amount left over, the 30%, is pure profit. This is far from the truth, as this margin must account for not just your profit, but all of the costs to purchase the property, sell the property, and hold the property, as well as the profit. These costs could be realtor commissions, title inspection, hard money lender fees, and so on. Depending on the value of the house and the transfer costs that are customary in the county that you are investing, this formula often results in a profit of about 15% for the investor. The formula relies on two critical numbers: the After Repair Value, and the estimated Repair Costs, and these must be as precise as possible in order for the resulting Maximum Allowable Offer to be accurate. The After Repair Value is your estimation of what the future sales price of your distressed property will be, after you have made repairs and upgrades. How to calculate ARV is somewhat involved, so I refer you to this step-by-step guide to calculating After Repair Value. If you are not experienced at estimating rehab costs, you could come up with a much lower or much higher value than is accurate. Consider ultimately using the high end of your value range, so as to include a buffer. You can review our primer on how to evaluate rehab projects and estimate rehab costs. Additionally, REI/kit House Flipping Software gives you the ability to estimate rehab costs using nationwide construction costs. What is the difference between Maximum Offer Price, Maximum Purchase Price, and the 70% house flipping rule? The Maximum Allowable Offer and Maximum Purchase Price are often used interchangeably and are what you would call the end result calculated by the 70% rule formula. Ultimately you should not purchase the property above the maximum purchase price, and so when the offer is accepted at its maximum, then it will equal the maximum purchase price. Now I’ll walk you through how to find your MAO. 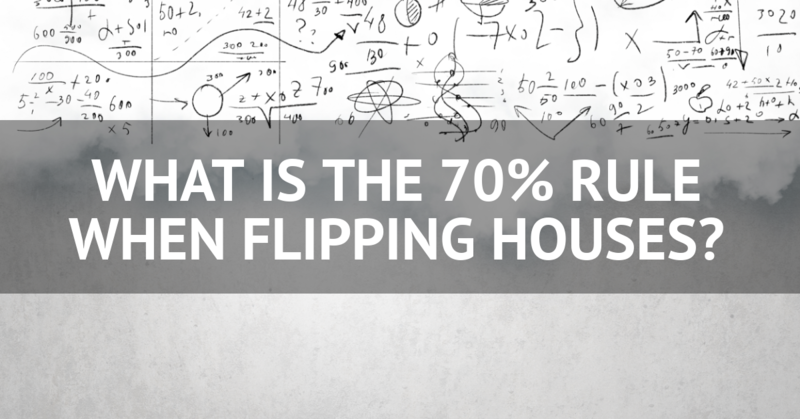 How to calculate the 70 percent rule formula for house flipping? To calculate your offer, simply plug in your figures, working on the multiplication between the parenthesis first and then subtracting your repair costs. This shows you that given the ARV of the property, and how much you think it will cost to rehab it, you should not offer more than $22,500 on 123 Main St.
You might be wondering whether or not you would benefit from breaking down your costs instead of using an estimate, or how to calculate your offer when you have a specific profit amount you want to achieve. Below I supply the formula that would address both of those factors. How does the 70 percent rule compare to a more detailed analysis? This formula is useful for when you are starting out, by including your costs and profit so as to get as close as possible to an accurate offer price. Once you know what the percentage is for your area (more on that below), you will be able to use the 70% rule quickly in the field. That brings us to the topic that quite a few investors engage in heated debate about: should the 70 percent rule ever be adjusted? In this next section I explain my take on this controversial topic. Can you break the 70 percent rule? I wrote earlier that the 70% rule for a fix and flip is used as a guideline to gauge profitability and the MAO. I use “guideline” because use of the word “rule” is inaccurate. It’s my stance that there is no cookie-cutter housing market or exit strategy, and each deal needs to be approached uniquely. Trying to use a blanket rule on every property will result in fewer offers being accepted, simply because your offers will be out of step with the market, while other investors have adapted. Below I list the circumstances in which you may want to adapt the 70% rule for house flipping. Generally speaking lower ARV, such as $100,000 and below, means purchasing at a lower discount, such as 65%. Why? Because there’s so little room for mistakes, and since the spread is slim, you need to purchase the property lower to allow for all of the expenses of the deal. When you determine the percentage of ARV on high-dollar flips, such as over a million dollars, the profit dollar amounts are much higher so you may be able to reduce the margin required for transfer and holding costs. Generally speaking, a mid-priced property that requires few or predictable repairs with no surprises, and if you can locate comparables that are spot-on with low days on market and can expect the rehab to go as planned, then you can adjust the percentage higher as a quick flip with lower profit, and it is actually more profitable overall than a long, drawn out flip with higher profit. Your choice of exit strategy also will help pinpoint the percentage of ARV that will likely result in a winning offer. The less conventional your strategy, the more control you have over the percent of ARV that is necessary for a successful deal. For example, if you are buying to hold, it will likely mean that you can purchase at a lower discount than someone who will perform a traditional flip with heavy rehab costs and a realtor commission to sell. You also have an eye towards appreciation, adjusting the percentage to account for potential income generation. If you have access to all of the cash you need for a flip, you won’t have cost of hard money to account for, also allowing you to buy at a lower discount. Every area operates on different margins, even down to a zip code or neighborhood. Understanding that, next let’s talk about how to determine what your market dictates. How to find out the percentage discount used in your market? “The Market” is not just a fuzzy number that is calculated from housing statistics. These sales were from actual people who flipped houses. These investors make up your market, and to get the most accurate understanding of the margins you can expect, you should simply ask them. When you go to real estate meetups and seminars, ask everyone who does fix and flips what percentage is typical for the area. If you are a wholesaler looking for deals, ask all of the cash buyers what percentage of ARV they are looking to buy at. If all else fails, you certainly can crunch the numbers by looking at cash sales in the neighborhood and comparing them to their rehabbed, sold prices, to make an educated guess as to the margins that flippers in the area are operating on. So, yes, you can — and should — break the 70% rule as much as the market and conditions dictate. The 70% rule and its formula provides an excellent guideline for both seasoned and new investors to calculate offers on a potential fix and flip. In this post I showed you how the formula is broken down, how to calculate your offer, what percentage you should use for your market, and scenarios for when you should “break” the rule. If you’re looking for advanced analysis, REIkit house flipping and wholesaling software allows you to calculate the Maximum Purchase Price using either the 70 percent rule, or input all of your costs and your desired profit to come up with a much more refined number, one which will allow you to offer more for the property beating out your competition, while still ensuring that you are going to be profitable. If you would like to see how that’s possible, I invite you to schedule some time on my calendar for a demo.